SEMA Hall of Fame - Joe Pisano, 1992, Venolia Pistons. 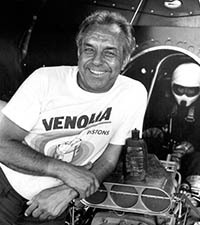 Joe founded Venolia Pistons, a company that designed and produced pistons and rings for all-out racing engines. But he is best known for the Funny Cars he sponsored in NHRA drag racing. It was the outstanding Candy Apple paint treatments on the cars that always got attention. Not long after he became a partner in what was then called Venolia Racing Pistons in the early 1960s, the company produced the first pistons that were forged rather than cast. Joe also had a partnership with Bones & Dubach, racing a 1933 Willys Gasser.